In early 2014 I thought about leaving Canada (grass is always greener on the other side) and work in Qatar (middle east) for 7-8 years. Oracle Laura told me 1-2 years maybe are possible. She couldn't see me staying longer. So I stayed put & had second thoughts. It turned out they started hiring before the place in Qatar was even operational back in 2014, still isn't operational in 2016 & the opening date is uncertain (rumors say maybe 2018). Oracle Laura helped me make a good & sound decision in not pursuing this opportunity. I prefer a good night sleep over endless worry. Oracle Laura was essential figuring out who is who in my professional life and especially in regards to investment decisions to be made going forward. She confirmed everything correctly as to what roles are represented by people who I deal with at a professional level which then allows me to make sound decisions going forward. She is even more helpful in regards to financial health as she is able to pinpoint exactly where the money should go and she is right on as whatever she recommended is outperforming the current stock market by miles (80% gain in the last week as we speak). My name is Tony Savino and I live in Yaletown. On June 25, 2015 I was in the Urban Fair shopping Centre at Davie and Pacific looking for my son's lost shoe. 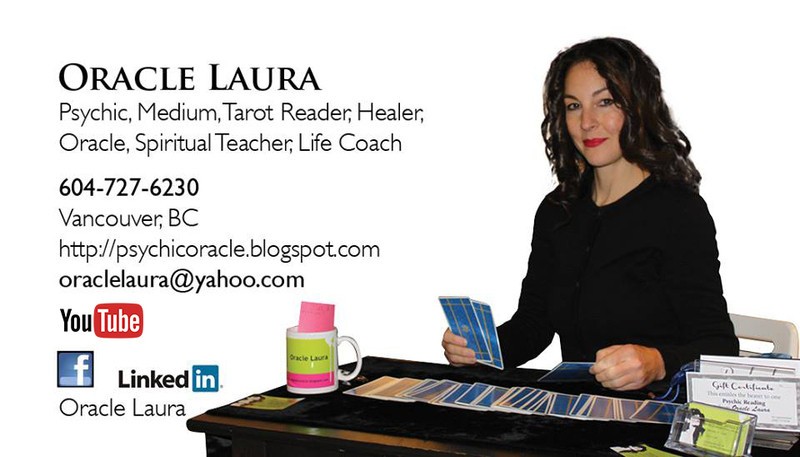 I happened to notice Oracle Laura sitting at a table, who I've met before at an open house. I stopped to say hello as I was on my way out of the store. I explained to Oracle Laura that I was looking for my son's shoe that was lost somewhere in the area during the past hour, Oracle Laura then told she would use her abilities to locate the lost shoe. Oracle Laura then closed her eyes for about 10 seconds, when she opened her eyes she told me that the shoe could be found to the East direction beside the curb. I then headed off towards the East looking for the shoe. several minutes later I found the shoe beside a curb on Pacific Street which was in a East North East direction from where Oracle Laura had told me the shoe could be found. I was impressed with Oracle Laura's abilities to locate my son's shoe and would definitely ask her for help again in locating a lost object. Hi Oracle Laura I thought I would give you an update on how the sale of the house I got your reading on is going I had a call from a woman last night that is very interested in the house and she will come and see you today she is an art teacher and her boyfriend is also an art teacher she said it would be perfect for her so it looks like your predictions about an artist buyer wanting it are coming true. My seller's house I had you visit and give a reading on is now sold to that buyer who is the artist you predicted would view it and want it. Hi Laura, Thank you so much for telling me to use squash soup for my husband who had 1 kidney due to cancer. It works well. In fact, recently after check-up from his cardiology, everything is fine. Thank you very much. The psychic reading opened me up to a lot of new ideas that I had been hiding inside & connected me to my Spirit Guides. Wow! So warm & loving. Oracle Laura gave me an awesome reading. I find myself now. She guided me in a special way. Oracle Laura was very helpful. She answered all my questions without having to ask. Thank you. Dear Oracle Laura, you made my day! You are real talent & you saw in me things I never thought somebody can see. I really appreciate your help & advice. Thank you. Something pulled me this way, to this chair, these tarot cards & this woman; Oracle Laura. May not like what you hear stubborn Aries/Taurus/Metal Ox, but remember to breathe, release old patterns, cleanse ailments, watch for signs, and know that you are headed towards harmony. There maybe a dog (loyal friend) in the picture. You dead Aunt says hello, but is not at liberty to say more. Let tears go & walk away with a smile. My visit today was an awesome experience. I got to communicate & receive messages from someone who had passed away almost 18 years ago. Getting these messages were very healing. The person who came through was someone I loved with all my heart, & it is a good feeling to know he knows I love & miss him. Thank you. Oracle Laura helped me greatly to dissolve family relationship knots & understand their effect on my health now& what to do to relieve that & continue on my journey responsibly. It was a gentle & honest experience. She was caring and perceptive & used the reading to clarify mind & spirit. Will definitely be back again. Oracle Laura is an amazing psychic reader. She told me what I needed to know about my present situation. She really gave me hope that things will be getting better for me in the near future. I really enjoyed my reading. Thank you Laura! You confirmed & gave me a lot of insights into who I am & how I am perceived by others & how to improve. Will see you again! Totally unbelievable, she is amazing. Whatever she says it's just so true. I'm happy that I made the decision to come here & see her! Oracle Laura is a wonderfully compassionate woman above all else. Whether you are going to her for healing or self-discovery, she will give you honest & compassionate insight. I highly recommend popping in! You never know what her and her guides have to say. I felt stronger & empowered! Thank you so much Laura! Wonderful! She hit the hammer on the nail. She allowed me to confirm what was going on in my life & made me realize that there was a choice I had to make. Lovely Laura you helped me too even though I'm psychic too! You knew right away I was also a healer & medium! Great reading. Will definitely be back for your services! Great reading. Very insightful & right on. I feel like I have a new direction & faith in the future. My experience with Oracle Laura was what I expected, with a few moments that stood out. I see several psychics and mediums throughout Vancouver. Laura has a strong connection to the spirit world and used the voice of a friend who passed to guide her in my reading. Laura tapped into my energy and spirit in a way I am yet to experience. She was able to read into me, my spirit and my mind very well at the start of my reading identifying my past friend, my current life and a few other specifics with only a moment of witnessing my reading. It took her a little time to home in on the specifics of my energies once the reading was underway. Once she had, the results were everything I had hoped for. She offered strong insight when I searched for how to move forward with what she could hear and see. Writing me a comprehensive list of things to explore and allow in my upcoming weeks. She read exceptionally accurately into my future plotting an idea of "stepping stones" I needed to follow to find where my destiny lies. She did make a point of searching the words in the tarot booklet for things that stood out and called, identifying a little too well at one point, one very specific word that struck every nerve in my body. Laura's spirit is filled with white light and seemed almost to sparkle at its fringes. She spoke candidly and without pretension, laughing when she found joy, and offering respect when she found hurt. Overall it was a great 20 minute reading at a level I would expect for the money I paid. Once she narrowed down on my energy, she could read very well and offered candid insight. She is well versed in her craft. I plan on returning to Oracle Laura in the early new year, to see what may have changed with the sun slipping once again behind me. If you are new to readings or are still exploring the wonders of having the craft performed in your presence, Oracle Laura will be everything you are looking for and I recommend her with a smile. It was a wonderful reading. Everything Laura said is absolutely TRUE about me. Thank you. Thank you Oracle Laura for tuning into issues I have been trying to sort out for myself. I will take your suggestions & look forward to the changes I see coming. Laura is very magical. She tells it like it is. It's all about the guides but with that I understand she sees the future & guides you thru it. Thank you very much Oracle Laura. The psychic reading was good to have. It felt like I needed it & you were there for me. You opened my eyes in a way and made me understand things. Thank you. Very eye-opening & insightful! A great reading! Thank you for a wonderful reading. You truly are amazing. You gave me hope for the future. Thank you Laura! Holy man! Talk about hitting the head bang on! I knew there were red flags but wow, now I know I need to seek further help at Al Anon as Oracle Laura has seen or sensed it in my psychic reading! This reading was a great "Light"; told me things I already know & experienced & gave me encouragement & hope! Appreciate the atmosphere. Feel good about the insight into my path of life for success & a good life. I have reassurance of where I am headed now & much relieved after. Thank you so much. Wow! Oracle Laura connected instantly with me in a very personal way thru her guide. I felt enlightened. Thank you! The connect that was made helped me with many things I needed answers to & made the new path easier to see. Thank you! Impressive. Felt the spirits as soon as I sat down. Thank you for the connection to the spirit world. You are amazing Laura! Thank you so much for the advice and direction. You made me feel connected with myself. Thank you for confirming the direction I knew I should follow. Amazing!! Not only did Oracle Laura say everything that's going on with me (without me saying anything) she also made me have faith in my life. I feel calm now. I know everything is going to be ok. Thank you. Thank you Laura. I appreciate your gift. You've opened the door a little wider and I shall pass thru it. See you again. Oracle Laura made me feel more connected with myself and my own intuition. She read tarot cards that were 100% accurate. Thank you! Laura gave me a reading that seemed pretty dead on to my life. I enjoyed the experience she provided me with and look forward to coming back again. Amazing Laura, your talent is hair-raising and somewhat creepy at the same time because of how exact and accurate they are related to my current situation. I've asked for signs and the universe led me to you. Thank you for those wonderful messages and advice. More power! Oracle Laura, Thanks so much for the psychic reading. I've been such a confused person but you enlightened me and gave me good advice! It's my turn to make it better for myself. Thanks Laura. Your cards and instincts helped me to piece together the pieces of my puzzle. I enjoy your dream and symbol analysis. All the best. Hi Laura, I felt so light listening to you. It was so emotional and so hue! I will do whatever you said. Cheers. Laura, Thank you for everything. All you said was true. Take care. Oracle Laura, Thank you for a great psychic reading, you're a very special person. Thank you Laura! You confirmed most of what I already sensed about myself but with the tarot card reading you opened my eyes. Glad I stopped by your studio and will be in touch to let you know the end of the story. Thank you so much for the love and guidance I was looking for. You confirmed many things I feared but I feel like I can move forward in a more positive direction. Thank you Laura, you opened your own heart and shared your gift with me. I really appreciate your words, wisdom, and advice! Very relaxing and soothing energy. The reading that I got was very in tune with the questions I wanted answered and I even got answers to a few I needed but forgot to ask. Thank you for the guidance. All very true. You have read me well. Will continue to listen to my soul. You confirmed all; exactly the same a gypsy had told me. Thank you kindly. Good advice and guiding. Helped me to easier make decisions in life. The tarot cards are very helpful, and made me change my opinion of life. Thank you. Wonderful advice! I walked in as a sceptic but definitely believe in the merits of readings now. She accurately pinpointed a problem I've been avoiding for some time. I'll definitely recommend her to anyone. Thanks Laura for all the wisdom and advice. I will keep them inb my mind. Cheers. Thank you for the insightful reading! Laura gave me so much information and opened my eyes, outlook of my life. Thank you very much. I am glad I walked into the mall and saw your sign. It was meant to be. Right on the mark, a clear road map of my life, struggles, and decisions with how to insure a harmonious balanced outcome. Excellent! Laura gave me a wonderful reading. She confirmed everything that is currently going on in my life. She is very precise and exact in her feelings and intuition. I appreciated the welcoming space and gentle approach. My questions were answered with truth that resonated to my very being. I left feeling positive and inspired. I did not believe that anyone could read me outside God himself but I think the way in which those cards fall in place is inspired me that Laura's guidance is very good and her cards are on point. Very on point, every card related to me. I felt like all the questions I've been asking myself were answered. Great atmosphere, very relaxing. I feel like this reading came at the perfect moment in my life and was a really helpful boost to aid me into making some important decisions that I have been avoiding lately, and it is very helpful to hear your thoughts that you may try to avoid relayed by another person, good or bad, it was a good reminder to have and I feel much happier and confident in having the knowledge that Laura and I spoke about. She will tell you what your soul's concern is without you telling her. Just listen and keep in mind what the unseen has to say and be guided by her. Laura is a gem. There is no one like you. You are truly the real mcoy, and without you, you wouldn't have shined a light on my path giving me so much hope and clarity. Thank you! Thank you so much for your help. It is really helping me a lot. And now I can hear their voices more clearly and know that it's not just my imagination. Hello Oracle I just wanted to say thank you for your advice from the previous questions. Very helpful. Oracle, Hi its nice to find someone as loving as you to share your personal information with everyone. Thank-You for your suggestions. Thank You again. I am starting to figure things out. My blessings to You. Hi Oracle, I believe you to really be an oracle. Thanks for the instructions about contacting spirits guides and meditating! I will try do as you advised! Oracle: Thank you for getting back to me, I have found your advice very helpful. Blessings. Oracle, Thank you for your help and many of your advice. I'm not new to psychic ability, however I am new to searching for and talking to others who are gifted. I have recently felt an overwhelming compulsion to learn, learn, learn and to reach out for answers (and perhaps give as well). However, in researching sites and chat rooms, I've become a little guarded. I'm mostly finding misguided advice and profiles that read as wish lists, rather than true ascended abilities. Over the past week (after finding a psychic forum) I've been reading as much as possible and finally decided to join, mostly because of you. Thank you again for your honesty and forthwith attitude. I love that you want to help others without ego (very rare nowadays). I'm currently at a crossroad in my life, where I seems to have had this urgency to read and learn everything I can get my hands on and really try to enhance and understand my own development, so thanks again and I look forward to the insights from you and others. Thanks for your story it is most illumination one so far. Thank you Oracle for sharing your knowledge with us. Good day and god speed. Hi, I read your advice and wow I don't think I met someone with that much psychic ability. Hi Oracle. I came here to search for some understanding and answers to a few things and you seem to be the person to speak to. I hope from all your experience your help guide me. Please guide me I feel the need to just lean on you. Kind Regards. Oracle, you are wise indeed! I thoroughly agree with everything you have said. Maybe you missed it, but I would appreciate it if you contacted me again. Please help me I need someone to teach me how to use my gifts. I don't know how to open it and use it. Please help me thank you sooooooooo much. One of the things I love is the feedback and posts from people who have differing levels of knowledge and background and experience. Thank you for sharing your story. It was very inspiring to read from someone who has found a way to live with their abilities in their day-to-day life. Gives the rest of us (such as myself) something to look forward to. Wow, that was great advice and very informative. Thank you so much for your input and caring. It means so much that you care and put forth the effort to let people know that. I love your guidance and reading your advice because you are so positive. Knowing that sometimes you just cannot change things and that people don't want to listen or just can't accept a psychic prediction helps us to understand that we are not alone. Its hard and can feel like we are isolated and freakish but there is comfort in having people that can understand us. Don't you also think its important to tell people that do and can listen to a psychic that they have the power to change things or at least affect the situation somewhat? Isn't it true that there is an order to things as well and if we can understand that order and the lessons that must be learned we can alter things, change them or speed up a process that was once keeping us stuck? Thank you again Oracle, your help is appreciated and comforting. Oracle, you seem very advanced in your walk with the spirit realm. 44 years and still sane. There is hope yet. Sorry I don't mean to sound flippant but I tend to joke about things that scare me most. I'm glad you are here helping others and lending your experience and wisdom to us all. I have to go make dinner but I enjoyed reading your story and comments. The world doesn't seem as scary when you find out you're not alone. I wonder how many people know the true meaning and cost it takes to be an "oracle"? Peace, light and love. Thank you for your responses Oracle. That was what I needed to hear. Thank you for your blog and posting your experiences. For some odd reason, I feel like I was meant to write to you. I feel like you can help me. I would like to learn and enhance my abilities. Hello Oracle, My name is Ashi and I just recently started reading the stories on a psychic forum and I never registered until I saw one of your posts. I am not sure if you can help me but my heart says that there is a reason that I am writing to you. Can I send you my photograph... For reading. I know this may be a little too much but I would really appreciate your help. Thanks...Blessed Be! Oracle, Thanks for your advice. I would love to develop my intuition since it could help me in my daily life. So yes, I would love to hear about your tips to develop my intuition. oracle, Thank you so much on the advise you gave me about contacting my guides. All the people you have reached out to help are grateful. Its people like you, who reach out a helping hand that give people like me some hope. Thanks again. Dear Oracle, thank you for your help. I was wondering if you would at all consider giving me your email address so I could ask more direct questions about what I am seeing. I believe it would be helpful to myself but understand completely if you cannot. Thank you for telling me about guides I plan on trying to contact them tonight. Oracle I have some questions that another friend told me you could answer. He said you were very helpful to him. I would like to find my Spirit Guide, I just don't know how. Also to rid of shadow people. I don't want to see spirits or shadows. I can't discuss this with anyone. Please help me on the journey of mine. Thank you in advance. hello oracle. I'm david. I have been reading your articles and you seem very knowledgeable and good-hearted. As for me - at this stage in my journey I am on the tip of the mountain and ready to fall. I feel like I have been waiting forever to accept myself and trust myself. There are family members pushing me towards it and also spirits seem to want this. I can't take not commiting to it anymore. I want to give in and believe in myself and what I have, but I'm so scared of what this might mean. I feel like everything will unfold once I do this. I know that it will be ok, but I don't understand why I won't jump. Can you suggest any methods or processes that could help me come to terms with this? This might be a bit much, but thank you for listening. Thank you very much for your help. I will use the info you have given me along with your past suggestions and give you an update soon. Once again, thank you. Hi Oracle, I think for the first time I have actually been able to find a person who can help me with some questions; you. Thanks for taking your time to help me and I am very much grateful for your answers. Hi-Oracle, I am very intrigued by you. My empathic abilities are now becoming more intense and I am developing visions that seem either very profound or very trivial. I also am feeling like I am on the brink of something big spiritually. I feel compelled to ask you the significance of this. There is more here, I feel some strange connection here. I know this is vague, but I feel this is all you need. Oracle, I was wondering if I could ask you a couple of questions. I see that you are very experienced in helping people and talking about abilities. Would you mind if I emailed you on a couple of things? Thank you for your time. Pay heed to the advice Oracle gave you. Those are more than just words, that's wisdom. Just sayin'.